Inspired by the 19th Century tradition of Floriography – in which the symbolic language of flowers was used to send discreet messages to friends, family or lovers through a carefully selected, curated bouquet – Bloom & Wild and Nikki Tibbles of Wild at Heart have excitingly come together to create their own series of coded bouquets where each flower has been given a contemporary attribute to create a modern-day floral glossary. Tessa was delighted to be approached alongside a host of influential names from the world of fashion, art, travel and lifestyle, including Lily Simpson (owner of The Detox Kitchen), Pippa Vosper (Fashion Stylist and Owner of the PIPPA Store) and Rosanna Falconer (Business Director at Matthew Williamson), to re-imagine and re-define the meaning of flowers. 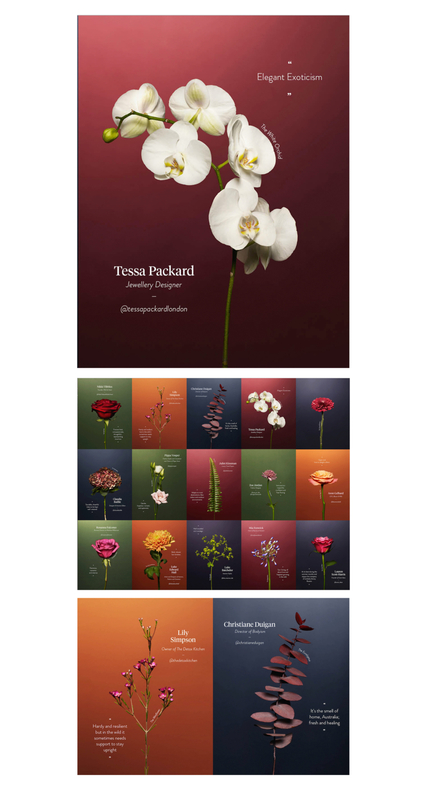 Her choice was the classic white orchid, with which she associated the words ‘Elegant Exoticism’, and this flower will form part of the exquisitely illustrated glossary to accompany each of the bouquets from the collaborative, new collections. The first collection of curated bouquets are two, classic letterbox flower bunches entitled ‘Autumn Mornings’ (£38) and ‘Woodland Walk’ (£40), and one luxurious hand-tied bouquet named ‘Red Skies’ (£65). Alongside the glossary, each bouquet will feature arrangement tips from Nikki herself, all enclosed within limited edition packaging. The collection launches on Bloom & Wild’s website and mobile apps on 1st September 2017. A huge thank you to Nikki Tibbles at Wild at Heart, Bloom and Wild and the lovely Scott Ideas for inviting us to be a part of such an exciting collaboration.